Understanding Thought Patterns: A Key to Corporate Leadership? Know the three basic legal forms of business. Know the two specialized types of corporations. The legal form a firm chooses to operate under is an important decision with implications for how a firm structures its resources and assets. Several legal forms of business are available to entrepreneurial business owners. Each involves a different approach to dealing with profits and losses (Figure 9.24 “Business Forms”). There are three basic forms of business. A sole proprietorship is a firm that is owned by one person. From a legal perspective, the firm and its owner are considered one and the same. On the plus side, this means that all profits are the property of the owner (after taxes are paid, of course). On the minus side, however, the owner is personally responsible for the firm’s losses and debts. This presents a tremendous risk. If a sole proprietor is on the losing end of a significant lawsuit, for example, the owner could find his personal assets forfeited. Most sole proprietorships are small and many have no employees. In most towns, for example, there are a number of self-employed repair people, plumbers, and electricians who work alone on home repair jobs. Also, many sole proprietors run their businesses from their homes to avoid expenses associated with operating an office. In a partnership, two or more partners share ownership of a firm. A partnership is similar to a sole proprietorship in that the partners are the only beneficiaries of the firm’s profits, but they are also responsible for any losses and debts. Partnerships can be especially attractive if each person’s expertise complements the others. For example, an accountant who specializes in preparing individual tax returns and another who has mastered business taxes might choose to join forces to offer customers a more complete set of tax services than either could offer alone. From a practical standpoint, a partnership allows a person to take time off without closing down the business temporarily. In a partnership of two home builders, if one were to suffer a serious injury, the other partner could take over supervising his or her partner’s projects and see them through to completion. Had the builder been a sole proprietor, the customers and the business would have suffered greatly. However, a person who chooses to be part of a partnership rather than operating alone as a sole proprietor also takes on some risk; your partner could make bad decisions that end up costing you a lot of money. Thus developing trust and confidence in one’s partner is very important. Most large firms, such as Canadian Tire, are organized as corporations. A key difference between a corporation on the one hand and a sole proprietorship and a partnership on the other is that corporations involve the separation of ownership and management. Corporations sell shares of ownership that are publicly traded in stock markets, and they are managed by professional executives. These executives may own a significant portion of the corporation’s stock, but this is not a legal requirement. In Canada, there are several types of corporations: a Canadian-controlled private corporation (CCPC); a public corporation; a corporation controlled by a public corporation; and an other corporation (you guessed it: the type of corporation that doesn’t fit into any of the other categories). Legally, the shareholders or owners of corporations cannot be held legally liable for the corporations actions, their financial risk is limited to the value of the stocks they own. A unique feature of corporations is how they deal with profits and losses. Unlike in sole proprietorships and partnerships, a corporation’s owners (i.e., shareholders) do not directly receive profits or absorb losses. Instead, profits and losses indirectly affect shareholders in two ways. First, profits and losses tend to be reflected in whether the firm’s stock price rises or falls. When a shareholder sells his or her stock, the firm’s performance while that person has owned the stock will influence whether he or she makes a profit relative to the stock purchase. Shareholders can also benefit from profits if a firm’s executives decide to pay cash dividends to shareholders. Unfortunately, for shareholders, corporate profits and any dividends that these profits support are both taxed. This double taxation is a big disadvantage of share ownership in corporations. A final form of business is a limited liability company (LLC). The Canada Revenue Agency (CRA) continues to treat the LLC as a corporation rather than a partnership, which results in classic double taxation to Canadian investors. Canadians should be aware that U.S. limited liability companies may be hazardous to their (tax) health. The three major forms of business in Canada are sole proprietorships, partnerships, and corporations. Each form has implications for how individuals are taxed and resources are managed and deployed. Why are so many small firms sole proprietorships? 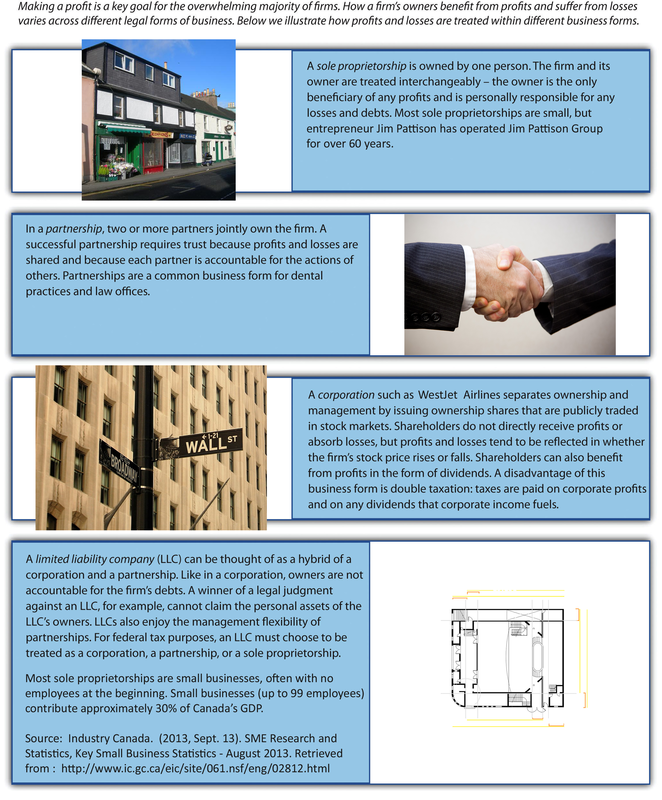 Find an example of a firm that operates as an LLC. Why do you think the owners of this firm chose this form of business over others? Why might different forms of business be more likely to rely on a different organizational structure? Legal Forms of Business by Janice Edwards is licensed under a Creative Commons Attribution-NonCommercial-ShareAlike 4.0 International License, except where otherwise noted.